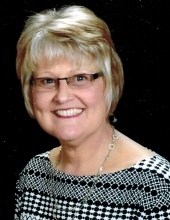 Susan ( Sue ) Marie (Leitermann) Jilk, 60 passed on peacefully to be with her Savior on Sunday, December 23, 2018 at home with her one and only true love (husband Steven) by her side. Susan battled colitis for 45 years. Her colitis disease led to her journey through PSC, Cholangiocarcinoma, and liver transplant the last 10 years of her life. Susan’s faith in God carried her through the rough times. She was born May 28, 1958 to Allan and Marcella (Mroczenski) Leitermann Marathon, WI. (They survive). Susan and Steve married May 10, 1980 at The Nativity of the Blessed Virgin Mary Parish, Marathon WI. They met at St. Anthony’s Retreat Center, Marathon, WI. Sue was a stay at home mom, who home schooled her two children. One of Sue’s greatest joys were spending time with helping her children “organize” new homes. She had a bit of a passion with being organized. While raising children, she owned a successful home-based window treatment business that she took over from her mother. She enjoyed singing on the Praise and Worship Team at her local church. Listening ,singing, and playing music brought joy to her soul. She played keyboard, flute and guitar. Another passion was to preserve memories in her journaled scrapbooks. Traveling with her husband was always a highlight for Sue. From their cabin to over 30 states they explored life together, with Hawaii being her favorite place. They also loved to ballroom dance, either on the dance floor or practicing at home. Late in life she added writing to her many talents. She wrote many stories for her grandchildren. Her big project was a published book about her health and her faith in God that helped her persevere through all her challenges. (As The Sun Was Setting by Susan Jilk) Sue spent many hours in her flower gardens and in the kitchen. Countless hours were spent canning fruits and veggies from the garden and baking for friends and family. Sue was a caretaker to all who needed help. She took the term “pay it forward” to a new level. She could be sick in the hospital one day and a week later cooking and baking for a sick friend. A faithful servant she was. Compassion was a huge part of her life, not only caring for her 1 pound baby son, adopted daughter, 4 foster children and especially helping to care for her 100 year old grandmother. Sue enjoyed starting a book club with her sister that brought balance to her life. A gathering of women supporting each other. Sue was a social butterfly and enjoyed spending as much time as she could with her family, friends and her cousins. She LOVED planning and hosting tea parties. Sue was very passionate about organ donation and to share with others the gift of life she received with her her own liver transplant that gave her family 5 more precious years with her. Her two little grandbabies gave her the will to fight to the very end. Her last big ear to ear smile came as a little girl came running into the house yelling, “Nana! I’m here!” with her toy doctor kit in hand. Besides her husband and parents she is survived by a son, Jason Jilk Marathon. Daughter, Dawn (Lucas) Gordon Tomah.Grandchildren, Cole and Ella Gordon. Brother Ken (Bonnie) Leitermann. Sister Brenda (Kevin Sorenson) Kaiser. Brother and sister in laws: Roger and Shirlene Jilk, Thomas and Paula Jilk, Donald and Stella Jilk, Shirley and Bill Newhart, Barbara and John Norquist, and Judith and George Kuzma. She is preceded in death by paternal grandparents Elmer and Eleanor Leitermann, maternal grandparents John and Tillie Mroczenski, infant Baby Jilk in 1980 and daughter Faith Marie Jilk 1981. The memorial Service will take place at 11:00 a.m on Saturday, January 5, at Highland Community Church, Marathon. Pastor Brian Whitaker will officiate. Visitation will be at the church from 9:00 a.m. to the time of service. Graveside service will take place following at St. Mary’s Cemetery, Marathon with Fr. Joseph Diermeier officiating. John J. Buettgen Funeral Home is assisting the family. For a complete obituary and online condolences, please visit www.honorone.com. To send flowers or a remembrance gift to the family of Susan Jilk, please visit our Tribute Store. "Email Address" would like to share the life celebration of Susan Jilk. Click on the "link" to go to share a favorite memory or leave a condolence message for the family.